How to make your blog look, act, and sound its best. Create a blog, grow your audience and keep them coming back for more! No matter what kind, or what function a blog has, they all share the same elements. 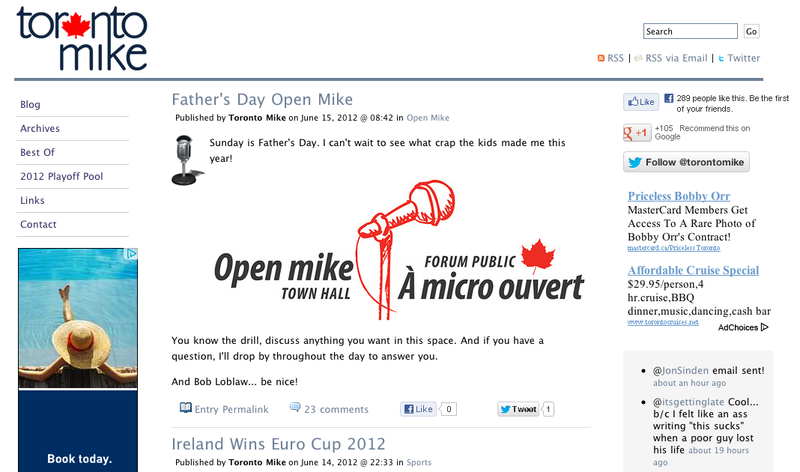 In his blog Toronto Mike, the writer (going by the apt pen name Toronto Mike) explores all things he finds fascinating. From sports to celebrity deaths, Toronto mike delivers videos and information with a decidedly Torontonian twist. A header at the top of a blog displays the name if the blog, often in a visual style or with logos. This header is visible on every page of the blog at the very top, thereby identifying the blog to visitors who may come visit a blog post first, without going past the home page. In this example, Toronto Mike has used a simple style to create a branded look, and continued the toronto/canadian motif in obvious fashion. At the top of any blogs home or main page, the most recent post is always displayed. As you scroll down the main page, the second most recent post will be is displayed, followed by the third most recent, and so on, in chronological order. The newest post is always placed at the top, making it easy to find the latest and greatest on the blog. As a new post is put on top, al the older posts shuffle down, staying in chronological order. 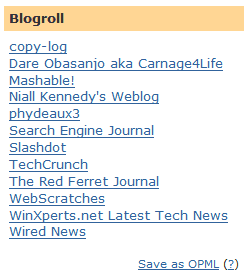 The number of recent postings on first page depends on the blog, but is often around a dozen. Most blog have an archive where readers can find older postings. - Other links such as ‘trackbacks’ 'send to a friend' (formerly popular for sending via email, or many social media options such twitter or the Facebook like button. The majority of blog are laid out in a column format, with most space given to the blog posts themselves. 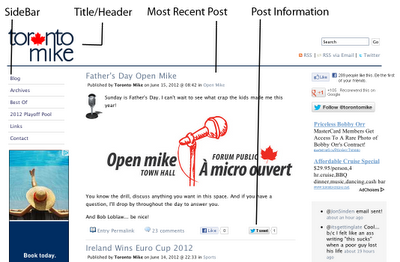 Other columns, called sidebars, often provide information about the organization/company or the blog itself. Some blogs don't have sidebars and some blogs waver from this general idea. 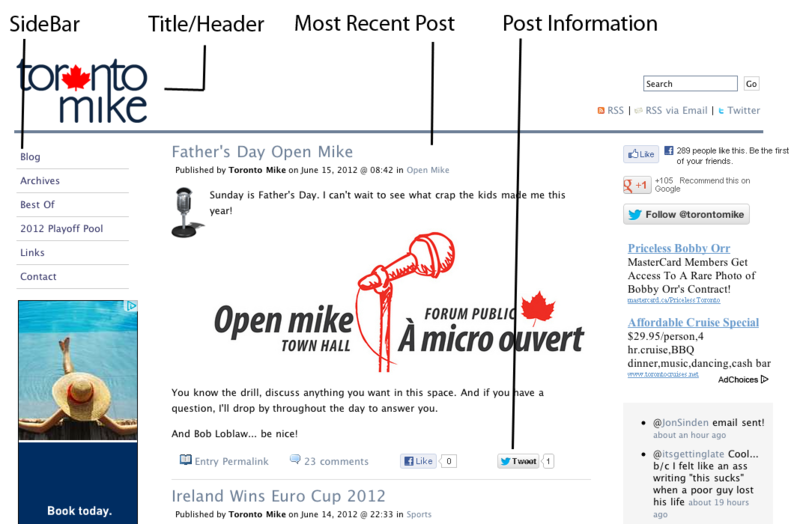 Some blogs even use sidebars as scrolling navigation. - Date Archives. 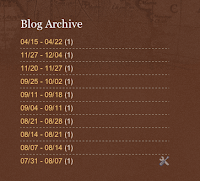 Almost all blogs are archived by date and/or category as the get published. 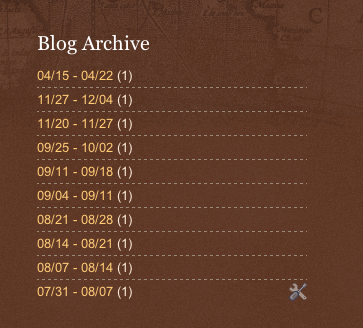 Many blogs, Such as our own (as of this writing) use the sidebar to provide easy access to the blog archive. The archive list can be broken down by Weeks, Months or Years. When posts are tagged as being in a certain category, the archive can reflect these posts based on this categories or subjects. This allows the reader to quickly find information that is similar to that which they are currently reading, and might interest them further. Clicking the category link displays only posts in that subject area. A blogroll is a list of blogs that the writer(s) think readers may find interesting or informative. By including other blogs that authors find interesting, readers can find new blogs and information. This is how many blogs become popular. A RSS (really simple syndication) feed is a way for readers to subscribe to you blog by using a newsreader (such as Google reader). When a reader subscribes via RSS, they can read the latest information without having to visit your blog to find updates. A small orange icon identifies the RSS feed.